There may be millions of devotees of godmen and avatars who have witnessed the apparent creation of objects from “nowhere” and are prepared to stand witness to the alleged creation. Can their testimony be taken at face value as true? No, because they are unable to see the phenomena from all the six sides. Moreover they fail to observe carefully because the creation of objects is done without their previous knowledge. The act is so swift and sudden that the observer sees only when the object is produced. Our senses work only with the help of the brain. Unless what is seen is registered in the brain, a phenomenon cannot be observed. The following experiments will illustrate the speed at which the brain really works and how our senses create illusions. Effect: You can’t catch a note when another person lets it drop. Props: One rupee note which is new, crisp, flat and unwrinkled. 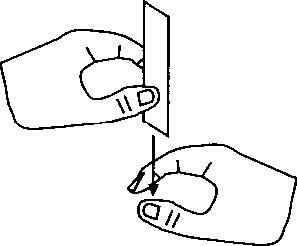 Method: Ask a volunteer to hold a rupee note between his right thumb and middle finger at the centre of the top, its long side downward. Let him keep the index finger and thumb of his left hand on either side in the centre of the note without touching it. When he leases the note, he can easily catch it with the other hand before it falls to the ground. Then you hold the note as stated before and ask him to catch it when you release it. He has to grab it when you suddenly release it without giving any advance warning. It is impossible to catch the note! The reason he succeeds when he does it himself is because his brain I able to send the impulse “let go” to the right hand at exactly the same moment as it sends one to the left hand signifying “catch”. So he has no difficulty grabbing the note before it falls to the ground. However, when someone else releases the note, the impulse has to be sent by the eyes, as they register the release to the brain. Only then does the brain transmit its message “catch” to his fingers. The note escapes in that fraction of a second before his brain can reverse its order to the hand. Similarly, with miracles, you know that a miracle has happened only after it has happened. It is not possible for you to observe how it happened, but being conditioned you believe a miracle has happened. Everyone with sight can see the sun rising in the morning and setting in the evening. We can swear to his as witnesses. But the truth is that the sun does not revolve around the earth. It is the earth which revolves on its own axis and around the sun, though it looks as if the sun revolves around the earth. This illusion of the sight can be demonstrated with two trains at a railway station standing on parallel lines. You are a passenger on one train and when your train moves, it seems as if the other train is moving, or vice versa. None of the senses work by themselves. The senses work only when the feeling of each sense registers in the brain. So what we really see is only what the mind wants to see.